This topic contains 7 replies, has 3 voices, and was last updated by Laurie 3 months ago. I have removed the header images but the blank white space still exists on the page. I want to complete remove the section or make the section slimmer so the content is visible easily. It is possible to use the custom header option and then leave it empty, so then it won’t show the header image and the page title and the page content will start immediately after the logo/menu area. In the page editor go to the ‘Header Area’ and select the ‘Custom’ tab and select the checkbox for the ‘Enable Custom Header’ option. 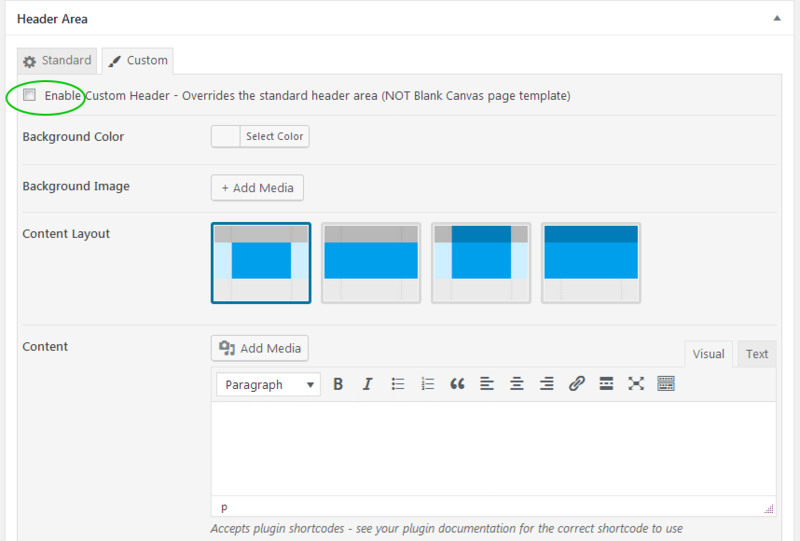 See attached image below which shows the custom header area in the page editor. Does it need to be done individually in all the pages? I wanted it to be site wide. Yes that is on a per page basis. Change the 80px value if you need to. Thanks, I will play around with both of these options. I have a similar issue, but the custom header option isn’t working for me. Even though I have checked the box “Do not show title and excerpt in header” and checked the enable custom header and selected the first of the content layout options, I’m still getting the header image. If I delete the header image, I get a gray box even if I ask for no background. I would like to skip the header image on my blog page and insert a custom title in the custom header. I was able to do this before the Gutenberg update. Also, only on the news page, the background of the masthead is not white, rather it is gray. This is the only page with the problem, and you can see it by the fact that my logo has a white background. I can swap out the logo with a transparent one; however, this page’s masthead will still be different than every other page on the site. There was some errant code in version 1.5.5 that was causing this issue where the custom header wasn’t taking effect on the ‘blog’ page. Please update to version 1.5.6 and it should be fixed. Yes, thank you. That fixed it. The topic ‘Remove Header Section’ is closed to new replies.